Last Friday night I enjoyed a dinner of extraordinary pairings—every combination worked exactly right, with sip and bite interacting in ways that brought out the best in each other. Nothing unusual about an excellent pairing, to be sure; but it is rare, for me at least, to sit through 5 courses in which each pairing is a winner. The event was a winemaker dinner at Sonoma Valley's Arrowood Winery, part of the annual Sonoma Wine Country Weekend—a three-day, blowout affair that includes dinners and lunches throughout the county on Friday and Saturday, Saturday afternoon's impressive "Taste of Sonoma" (160 wineries, 60 chefs) on the grounds of MacMurray Rarnch, and a mega-fun auction on Sunday at Cline Cellars. Proceeds benefit charities, so it was nice to see that, going into the weekend, events were sold out (gross proceeds for the weekend amounted to $1.4 million). 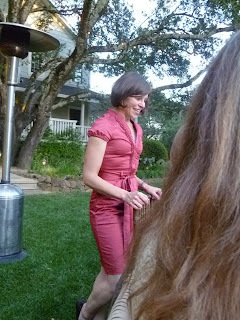 Our host at dinner was Arrowood's convivial winemaker, Heidi von der Mehden, who did a nice job of introducing each wine as it was poured. I was having such a good time that I forgot to take note of vintages, but all were either 2006 or 2007. 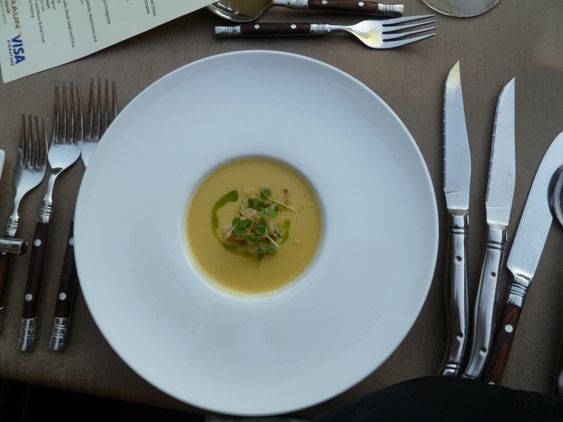 The impeccable chilled corn soup with crab and basil oil! My favorite surprise pairing was the grilled peach tart with the Late Harvest Reisling. The peaches were the kind you buy in early July in a small outdoor market in an out-of-the-way village in the south of France—that is, they were absolute perfection, exactly what peaches should be but so rarely are. They were grilled so little that they were practically raw. The tart crust was light and airy. The reisling was fruity, with a hint of sweetness. The whole course was a sip-and-sigh. I don't normally even like dessert, but I sure liked this. Eat local and be happy.